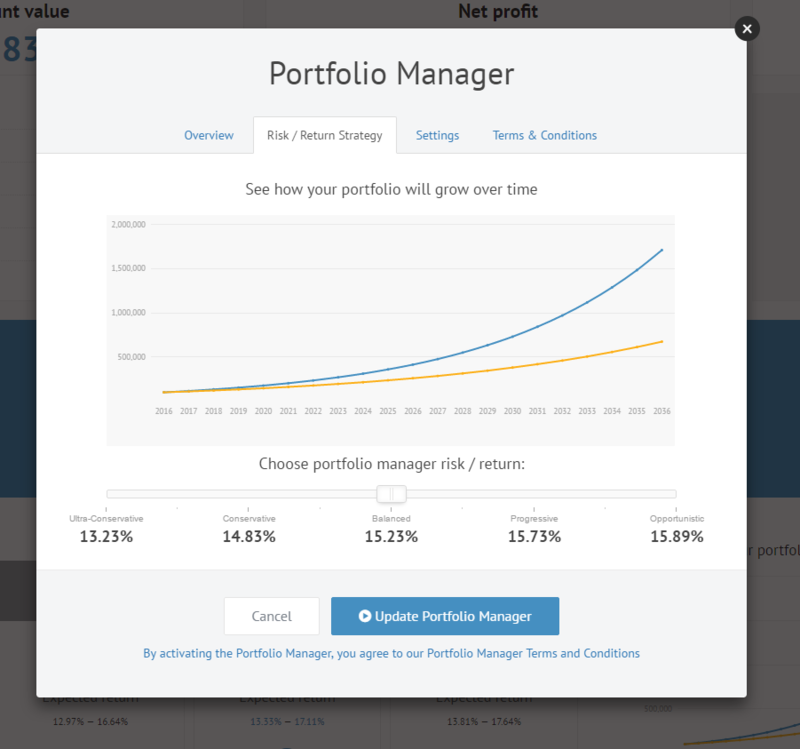 We are very thrilled to announce our biggest Portfolio Manager and Dashboard release to date. Since last October we have fine-tuned our two most actively used products a couple of times. In the first weeks of August we are making a great leap forward and adding a lot of features heavily requested by our investor community. The suggested investment size calculation now takes into more data specific to your portfolio and strategy to arrive at the suggested investment size. The algorithm includes six variables: (1) point of diversification (X – by default 200); (2) the desired capital deployment period (Y – by default 2 weeks); (3) the number of loans expected to be available for investment over this period (Z); (4) your total deposits (T); (5) your available cash balance (C); and (6) your expected cash inflow over the defined deployment period (CF). The suggested investment size is calculated by dividing your cash balance and expected cash inflow over the defined deployment period with the number of loans expected to be available during this period. In simple terms the suggested investment size equals (C + CF) / Z. The minimum investment is 5 EUR as before. The maximum investment is calculated by dividing your total deposits with point of diversification (T / X). Point of diversification is the number of loans that you should include in your portfolio to have a reasonably diversified portfolio. Investors who feel that the default settings do not suit them can override most of the individual variables in the formula above. You can override point of diversification, and capital deployment period. You can of course set your own minimum and maximum amounts instead of using our formula. Additionally you are able to define the free cash balance you would like to keep on your account for withdrawals. Investors on Bondora are not all investing with the same amounts of capital. Therefore some investors are making considerably larger investments into single loans compared to others. We are now adding an option to split your investments into smaller bids in order for larger investors to be better able to liquidate parts of their portfolios. In case your investment per loan is 100 EUR and you have defined the bid size to be 15 EUR then the system will make 7 bids into a loan, 6 bids of 15 EUR and 1 bid of 10 EUR. Investors looking to increase or decrease the available investment pool will be able to do so by choosing among 9 strategies. We are adding Ultra Conservative as well as Opportunistic strategies as well as options in between the 2 new and 3 existing strategies. Please remember that these strategies remain within the context of Bondora and therefore an Ultra Conservative strategy cannot be compared with an ultra-conservative stock or bond strategy (e.g. blue chips or German bunds). 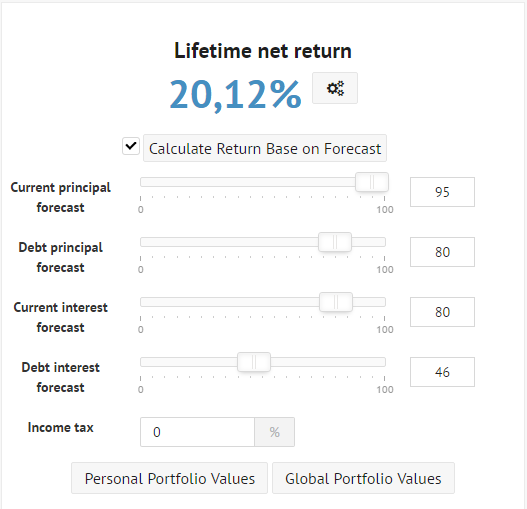 Bondora should be viewed as higher yield part of your portfolio and total portfolio allocation towards Bondora should be set based on this assumption. 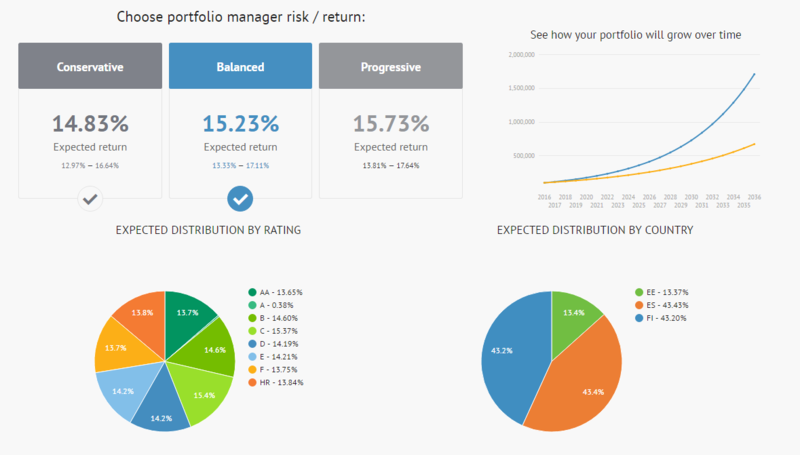 The expected portfolio distribution charts calculation includes both your existing and new loans. The loans that are expected to be added to your portfolio over the desired allocation period are added to the existing portfolio to arrive at the estimates. The estimates for new loans are calculated based on your chosen risk-return strategy and recent market statistics. We have been steady increases in secondary trading since we introduced our API. However the trading still considerably lags behind Primary Market volumes and available inventory as most investors are not using the Secondary Market. We are addressing the liquidity constrain by adding Secondary Market inventory to the pool available for the Portfolio Manager. This step will both increase the liquidity for existing investors as well as allows new investors to buy into seasoned and lower risk assets. The Portfolio Manager will initially buy only loans that are not overdue (principal nor interest) at a price equal to the principal balance or below. No trades will be made above par or on overdue loans until it’s possible to completely harmonize the Primary and Secondary Market pricing. Selling your investments will be made extremely easy. You will be able to define the amount of capital you need and the system will do the rest. This feature is neatly packaged on the Dashboard. Loans will be put on sale with current loans first and overdue ones thereafter with newest loans sold first before seasoned ones. The sale price will be calculated as the principal balance less principal payments overdue by schedule. In other words if you put your entire portfolio to sale then it will be priced the same way as the account value is calculated. Many active investors have their own views on the future. A couple of months ago we released the new cash flow page that allowed overriding our net return calculation with estimates of your own. 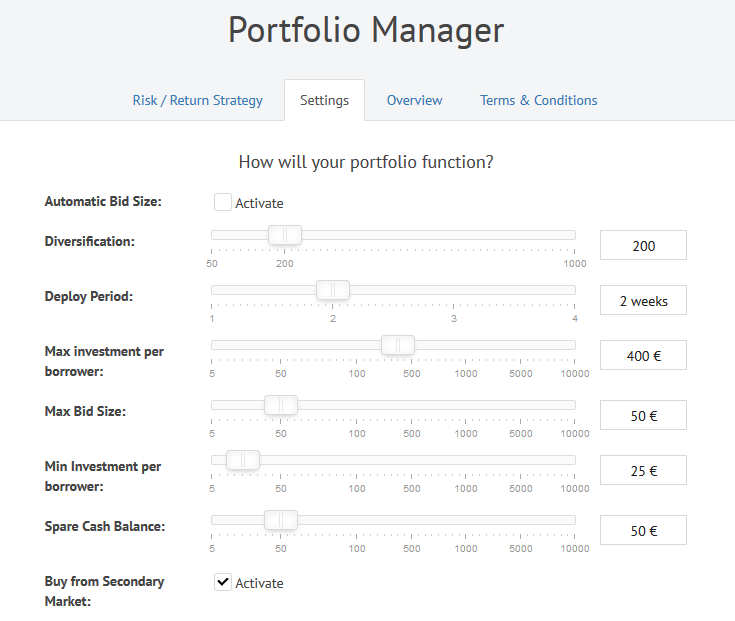 We are now adding the configuration option to the dashboard as most investors do not use our more advanced features. The simulation tool will allow you to set your own estimates for the likelihood of principal and interest to be received from performing plus delinquent loans and loans in default. You can either use estimates calculated based on your and overall Bondora portfolio or derive these numbers through the historic cash flow, personal statistics or data export. Our customers outside of Eurozone or who do not have a euro account can now easily withdraw money through Transferwise. Simply enter the withdrawal amount and use the Transferwise option. Everything else will happen automatically.